Discussion in 'Making Your Mark' started by ToddR, Jul 20, 2018. I'm working on making an etchedr from a dc transformer. Its 12v, 1 A and was easy to take apart. As I understand it, and I'm weak in electrical, I need to add 2 wires to the output side of the big magnet dealie before the circuit goo. In Dan's example, it looks straight forward but mine has 3 wires coming from the magnet, 2 blacks and a red. I'm not sure which two to use. I was just going to tie into the wires. I dont know if this makes sense or is doable via pictures but I posted some below. I'd appreciate any tips or ideas. The second one shows the wires coming from the block. Are you trying to make one with both ac and dc output? Yeah, I was using the one that Dan has posted on his site. I found an old RC car battery charger that looks perfect but I'm a dunce when it comes to electrical work. Looks like a center tapped secondary. I'd use the two black wires for getting the AC out. In your model there are two diodes instead of four. The two diodes are being fed with the AC wires you want to tack on to and bring out to your switch. Don't laugh but, do you mean those two cylinder looking things in the last pic? 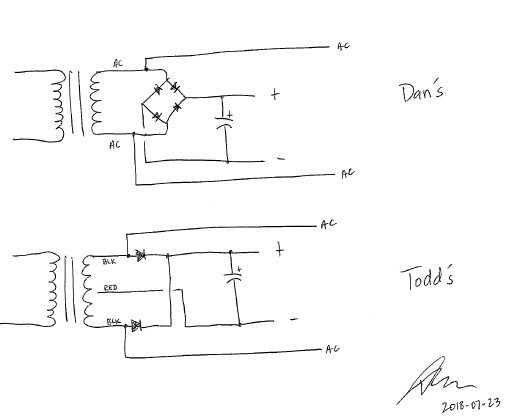 Are you saying I should explicitly come from the diode (solder to the other side of the board like in your example) or can I just splice into the black wires before the diodes. I'm not sure what the diodes do for me. I don't know why because I'm a math and science guy but electrical theory (and most things financial related - I'm told) I just don't grasp at all. Thanks Dan. Also, do you need a better pic? I could draw a diagram. I'm reluctant to take it apart because I am sure I'd mess it up. These things looks so fragile. 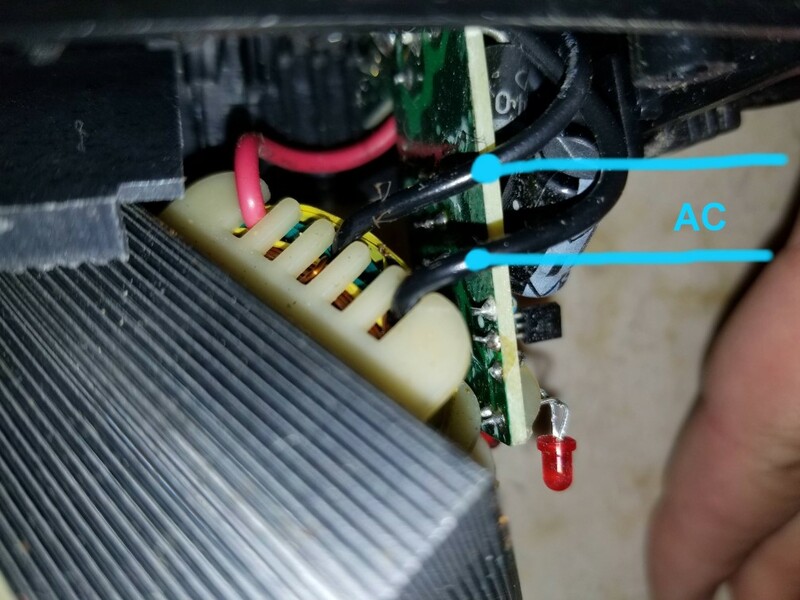 Follow the black wires from the transformer (big magnet dealie). You can solder the wires directly to the wire leads on the diodes (black cylindrical things with a silver band and numbers on them). Solder to the end where the black wires meet the diode leads. These are the ends of the diode that do not have the silver bands. If you carefully twist and loop your wire leads around the diode leads to make a good mechanical connection before soldering it makes it easier and more secure. Just make sure no stray wire strands are touching anything else. I tacked my wires on the underside of the board as the diodes in my adapter are physically smaller and harder to get at. You can do the same if it's easier for you. Give is a pic before you power it up. Anywhere along here. At the board, at the diodes or you could even strip some of the insulation off the black wires and attach your AC leads. If you choose to strip the insulation off make sure to put some electrical tape around the connection afterwards. Awesome. Thanks Dan. I was hoping for that. One more question. I'm pretty sure I'm okay with adding a "master" power switch for the whole unit. I'll just snip the chord on the plug and leave 6" on the inside of the box wired into my switch and run the remaing chord to the plug. But, on the alligator clip side of things, it's a bit different. Assuming that I want to use these same clips for both etching and marking, I'll need to cut them too right? My plan was to ignore how they're connected to the guts of the adaptor and snip them a few inches past the little circuit board thing and use them as the connecting wires on the "etch" side of the switch. The "mark" side will be the method discussed above. Again, I realize this is probably obvious to you guys but I struggle with this kind of thing. It's a hard thing to learn by trial and error which is really how I learn most things. Anyway, once again, I appreciate the help. Thanks to you too specifically Dan. I can't tell you how helpful your site and you yourself have been. Wow, that's very neat and tidy. But yeah, if i can do it that well I will but I was just thinking it would be smart to have a switch for the whole thing by switching the AC chord itself. Right now the gator clips are attached to where they need to be for the "etch" setting so, I can leave them be too and attach them into the proper side of the DPDT switch and reuse the rest of the lead with the gator clips for both etching and marking (they'd go to the center of the DPDT I guess). I could just use the case itself and get little toggle switches maybe. I'll have to take a closer look. Something along those lines anyway. I put mine into a power bar and use the switch on the powerbar to turn the main power on and off. Just to be certain, there is only one clip and one pad. These are permanently wired to the centre contacts of the DPDT "mark/etch" switch. When the switch is flipped in one direction DC is going to the clip/pad. In the opposite direction AC is going to the clip/pad. These little toggle switches' contacts work opposite to the lever. When the lever is "up" the middle and lower contacts are making. When the lever is down, the upper and middle contacts are making. Just a heads up. Yeah, sorry, that was unclear but that was my intent. I've seen where they grasp a Q-tip with one alligator clip and dunk it in the solution. But it may be a better idea to make a wood block and go with the felt pad thing. I see, makes perfect sense now. The pad works very well as it sits flat on the stencil. HINT: If you are not going to use the machine for a while, take the felt off the pad. Otherwise, it will corrode whatever metal you have in contact with over time.